This nice scan was sent by Joe S. from USA: "I believe it is simply struck through grease, but the seller calls it a "50c on 5c planchet"..."
from ANACS - the 50c on 5c is actually a 50c on 2c!! 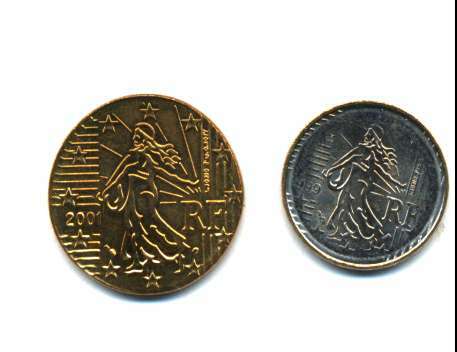 the other coin (right) is a 50 Cent struck on the wrong planchet. 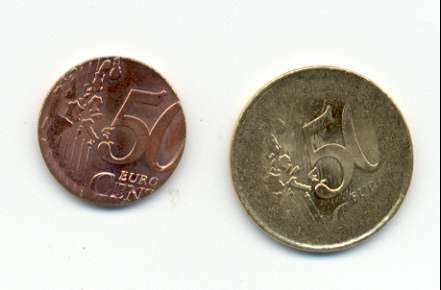 The last image on the left is provided by Julien Couto who say: "THE FRENCH 50 CENT PLANCHET IS A 50 CENT ON 20 CENTIMES OF FRANCS !!!" Joe have two other errors. 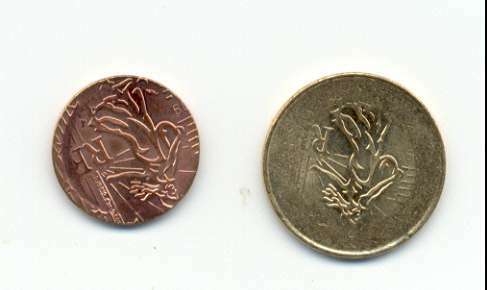 One is a 50c struck on 20c planchet and the other is a 10c struck on foreign planchet. Again compliment to Joe! His collection is really interesting. 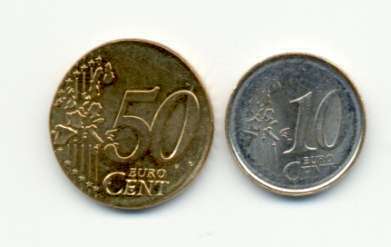 This Coins owned by Chris R. M. are 10 Cent struck on wrong planket and 50 Cent on 2 Cent planket. 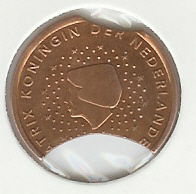 In the image you can see also a 1 cent with two reverses, Chris have 2 of this coins!